and the Largest Selection Of Mexican Palm Thatch Umbrella Materials Anywhere! What Size Replacement Palapa Thatched Cover Should I Buy? Step 1. Measure your umbrella or frame from the top center tip to the outer edge. Step 2. Multiply that figure by two, then add one foot (the added foot provides for the umbrella overhang). Example: If the measurement from the top center peak (so you will be measuring half of a circle at a angle) is 4ft to the outer edge of the frame, times that by two which is 8ft then you would order a 9ft palapa umbrella top cover. This will give plenty of overhang around the umbrella edges. Make sure the lowest part of your umbrella frame (outer ring) is no less that 7.6 feet from the ground or the grass overhang may be to low and may touch your head when walking underneath, then trimming may be required. Made from Rustic Tropical Pinewood Poles! There is a name for those beautiful tropical umbrellas that accent patio tables: palapas. Also known as grass thatched umbrellas or grass umbrellas, palapa umbrellas are made from rustic tropical pinewood poles. In their native lands, they are purely functional as shade structures. However, in suburban America, palapas are a popular way to add a tropical ambiance to nearly any outdoor living environment. Both Standard & Fire Retardant and So Many Sizes! 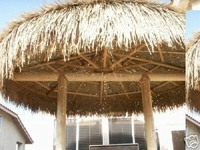 The Tiki Shack Importer carries both standard and fire retardant palapa thatched umbrella, available in numerous sizes, more sizes than any other company. 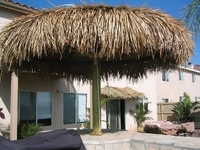 Generally speaking, our palapa thatched umbrella has an excellent lifespan. In dry climates with little rainfall, these palapa umbrellas can last five to seven years or more. For those in moist climates and heavy rainfall areas also when using any thatch material on a closed or plywood roof it does affect the lifespan trapping the moisture. Creating a air space between the two layers will help. We highly recommend our thatch sealer; often, it can extend the life of palapa umbrellas by up to two years. We also offer palapa umbrella covers, which make it easy to transform ordinary commercial style outdoor umbrellas into palapa umbrellas. In Addition, to make your life easier, we also offer Easy Do it Yourself Palapa Kits. You can view all of these products on the "Palapa Kits" category page. Click Here to View it Now. If you wish to make your own palapa umbrella, this can be done by using a palapa cover to hang over a pre-cut wood frame. All palapa umbrella pictures have two layers meaning you would need two covers to get that thickness. Proper Installation is Key to a Long Life! Unlike other umbrellas, a grass umbrella allows the wind to pass through it, which means less strain on the structure and a longer life for the product. However, proper installation is key. To ensure your palapa umbrella will withstand the impact of strong winds, use nylon zip ties or staples when installing one of our palapa umbrella covers to wood framing. These are designed for a permanent install not recommended for removing and installing every season. Our palapa umbrella covers include a supply of nylon zip ties for this purpose. Make sure to pull the zip ties tight. Pliers works best. Use all zip ties that we supplied to you and use them everywhere even in the center. If not secured correctly your palapa covers will start to fall apart usually in the center first it will create a hole and then get bigger and bigger causing it to tear everywhere else. This is typical of a bad installation. When you are ready to install the palapa cover remove plastic and all strings that hold palapa cover except for the one at the widest end. Climb ladder and set the pointed end of the palapa cover in the dead center of your structure, very important that it is center before cutting the last string. Once centered cut the last string and start unfolding the palapa cover till you have a half of a circle. Now take a push broom and go under one layer and gently push the palapa cover to the other side. Now go around the outer edges and get all of the ripples out and attach all the nylon zip ties everywhere that we supplied you. Make sure to pull all zip ties tight with a pair of pliers and cut excess off. Because we are the Market Leader! Trust the same company that supplies Tahitain thatch, African thatch and bamboo items to Disneyland, Sea World, Raging Waters, Universal Pictures, Senor Frogs and Hooters and so many more. Order palapa umbrellas for sale online and get free shipping! Please Note: When ordering the bamboo collapsible umbrellas below, be aware that the poles are bamboo and they are not always straight. Bamboo does not grow straight. No refunds on bamboo products. If installing our palapa umbrella covers on your bbq island palapa structure make sure to completely rinse off the palapa cover prior to installation to remove any clay residue from staining counter tops. These are made in the villages in Mexico and are made by hand and are assembled on dirt. Sealing your complete bbq island is recommended. *** FREE SHIPPING NATIONWIDE *** → All Prices Below Include Free Shipping to your Door! → 80% of Orders Ship Same Business Day! "Browse our Palapa Thatch Umbrellas Below"
The definition of Palapa is a traditional Mexican shelter roofed with palm leaves or branches. It is a Spanish word of Mayan origin meaning pulpous leaf and refers to an open-sided dwelling with a thatched roof made of dried palm leaves. With its unique design to help airflow, it is widely desired in tropical resorts where temperatures are particularly high. A structure such as a bar or restaurant in a resort area is generally referred to as a Palapa. Another structure to be referred to as Palapa would be a thatch umbrella, open sided with a thatched cover. They are also popular with backyard enthusiasts to create a tropical paradise with a thatch roof Tiki bar and a Palapa thatch umbrella. Because of their natural look, both bamboo and Palapa umbrellas create a relaxing environment and a tropical d�cor. Both Palapa and bamboo are plants, used in the creation of many items such as fencing, chairs, dividers and countless other items. Palapa styles can be woven palm leaf, African reed, or synthetic palm or reed. In their native land, Palapa thatch umbrellas are purely functioned as sitting under the thatch lowers the temperature by about 10 degrees as the thatch breathes, which makes it a welcome addition to your own island retreat. As a multi-functional item, it can be used inside or outside. It comes in various sizes and styles, and these umbrellas can be placed into virtually any setting and bonded with grass, wood, or cement and be totally functional. 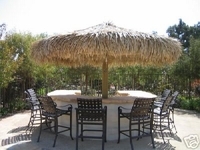 Different styles include the Tahitian round umbrella totally covered by thatch with a shaggy appearance fitting with a forest d�cor; like the Tahitian, the Mexican style also features a shaggy look and is known for its durability to withstand rain. Modern, contemporary styles call for the African style with materials from mostly African areas. For ease of maintenance, opting for the artificial thatch is an option. Palapa umbrellas come in standard or treated with a fire retardant to provide a higher level of safety. They also come in a variety of sizes and have an excellent lifespan. The grass thatched, or grass umbrellas are made with natural pinewood poles. Keep in mind that if you are ordering collapsible bamboo umbrellas, bamboo is a plant and does not always grow straight but is totally functional in its natural form. You can order the collapsible bamboo thatch umbrellas in sizes of 5ft. 7ft. and, 9ft, in standard form or fire retardant. Palapa and bamboo umbrellas are low maintenance and made from 100% natural materials. When deciding what size thatch umbrella to use, consider the area where it is going to be used, is it a small patio table or a larger area that needs to be shaded and take into consideration the size of your yard. It should be tasteful and flatter your island theme. The bamboo thatch umbrella is made with a thick bamboo pole and real seagrass made to be portable. It has a two-piece pole that can be unscrewed for storage or, depending on your climate, can be left up year round. It features the best commercial grade quality thatch that you can buy. To extend the life of your bamboo thatch umbrella by two years, you have the option of thatch sealer being applied to your order. If you are looking for a Palapa umbrella top cover, they can be ordered in sizes from 7ft up to 15ft, and weigh from 20lbs to 90lbs respectively, depending on your needs. They are designed to cover your existing umbrella frame, leaving a bit of an overhang around the edges, giving it that nice, tropical look. The Mexican Palapa thatched umbrella have a woven knot interior and the exotic shaggy effect exterior, the look being achieved by the hand-woven palm leaves. Mexican cape covers are meant purely for shade; multiple layers would be needed to make it waterproof. 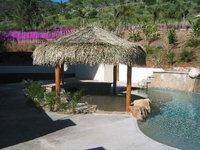 In most climates, the Palapa thatch umbrella covers should last 5-6 years outdoors, and indefinitely inside, with two years added if it is ordered with thatch sealer. It is also available with fire retardant and comes with a fire certificate. These commercial grade covers are the same as are sold to resorts and amusement parks such as Disneyland and Sea World, among others. These products are not recommended for canvas covered market umbrellas. The Mexican Palapa umbrella cover will convert an existing gazebo or umbrella into a tropical Tiki umbrella. Installation of your Mexican rain cape umbrella cover is simple and easy. Fit it over your existing umbrella cover and attach with zip ties, no special skills or tools are needed to complete installation. You can also use staples, but zip ties are recommended, pulling them tight with a pair of pliers ensures a good, solid fit. Free shipping on umbrella kits! The kit includes instruction sheets, pinewood poles, all the hardware, two thatch covers, wood slats and the center main pole, which is 8ft long and 6" in diameter for the 9ft kit. The 12ft kit includes a center pole of 6' in diameter with a 10ft pine lodgepole, while the 15ft kit features a 7' diameter and 10ft pine pole. All the kits are made in-house with no outside contractors, with everything but the slats being pre-cut and pre-drilled. Assembling the umbrella kit yourself saves hundreds of dollars and assembly is accomplished in about two and a half hours with the included step by step instructions. The thatch Palapa umbrellas, once assembled, should withstand 60-70 mile winds. Top quality pinewood makes up the frame and should last many years in all kinds of weather. The kits are made to order and ready to ship in 3-4 weeks. The same kits are sold to water parks, theme parks, amusement parks, movie sets, hotels, and exhibits. Also available is a four pole, 12ft diameter Palapa kit. 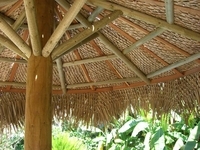 Designed to replace the covers on bamboo umbrellas, grass piece only, can be ordered with or without thatch sealer. Bamboo pole and grass thatch top, these are similar to a folding market umbrella with a two piece pole that unscrews to take down or can be left up year round. 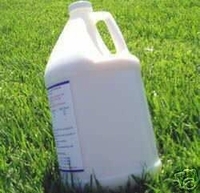 Comes with or without thatch sealer. 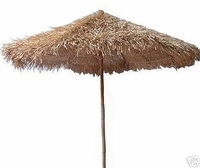 Convert your heavy-duty umbrella into a tropical Tiki umbrella by adding grass fringed thatch, can be ordered with thatch sealer or fire retardant. All umbrella cover sizes can be ordered with fire retardant and with or without thatch sealer. Come with detailed, easy to understand directions, pinewood poles, all hardware, 2 umbrella covers, and everything precut and predrilled except the slats. A center pole and rope complete the order.